The U.S. authorities have charged two Ukrainian hackers for hacking into the Securities and Exchange Commission's EDGAR filing system and stealing sensitive market-moving reports of companies before their public release. "The traders compensated the hackers, including Ieremenko, for the information by either paying regular fees for access to the hacked press releases or by kicking back a portion of their trading profits," the indictment reads. According to the prosecutors, the hackers allegedly sent phishing emails to SEC employees to gain access to agency's network and then infected some of its computers with a malicious program that automatically extracts documents. The scheme extracted "test filings" that companies submitted to EDGAR hours or even days before actual filings that were intended to be made public. "In some instances, these test filings included submissions by public companies that contained earnings results and other material information that the companies had not yet released to the public," the indictment reads. "The hacked material nonpublic information was then transmitted to traders who, in connection with approximately 157 earnings announcements, used it to place profitable securities trades before the information was made public." 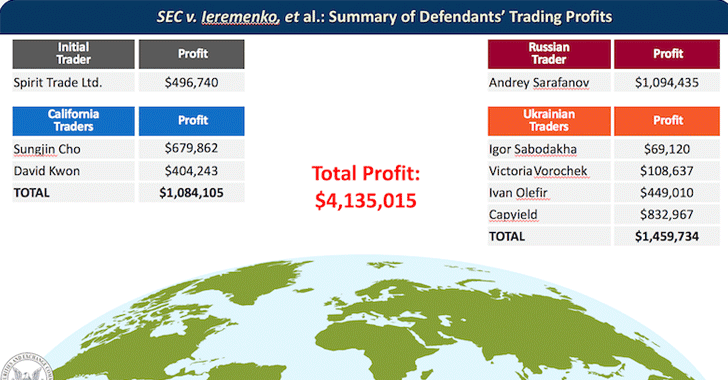 Ieremenko, who remains at large in Ukraine, had also previously been charged in 2015 over the theft of over 100,000 unpublished press releases from PRNewswire, Business Wire, and West Corp's Marketwired in order to make profitable trades.